It’s a familiar tale: any time I once made to play Metal Gear Solid, Pro Evolution Soccer or PaRappa the Rapper has long since been eroded by the glamours of parenthood and an erratic work schedule. Mario Kart Wii still gets spun up, as much of an occasional treat for me as it is for my kids. I am the ‘lapsed gamer’. But I do still play games. Armed with my smartphone or tablet, pocket puzzlers like the stunning Monument Valley, gory graphic novel epics such as The Walking Dead or riddlers including Mr Robot help ensure that train platform dead-time can still be game-time. I’ve yet to tire of exploring new places with Pokémon Go, and I stand firm that the Swift Playgrounds lessons are every bit as satisfying as a good Sudoku puzzle – plus I get to learn a valuable skill. I am the ‘on-the-go gamer’. Living the smartphone gaming dream I am part of the fastest area of revenue growth in the games industry. So, when Nintendo formally announced its latest console last Friday I wondered if it was an attempt to appeal to gamers like me. Nintendo Switch is a hybrid tablet/TV games console, as comfortable in your hands as it is hooked up to your television. Accompanying the hardware is a strong first year line-up of titles including new the Zelda Breath of the Wild and Super Mario Odyssey adventures. 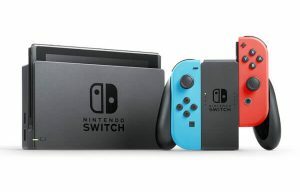 But the big question is whether Nintendo has given itself enough of a fighting chance with the Switch to emerge from the shadow of the debacle that was the Wii U, to overcome the console behemoths that are Microsoft and Sony, and to take on the smartphone gaming market. That was the topic of the story I wrote this week for Mobile World Live: “Will Nintendo fanboys make the Switch?”.